Alyson Grant graduated from University of South Carolina with a BS in biology and minor in psychology with emphasis on human biology and genetics. 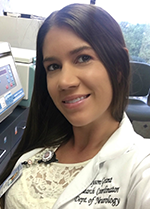 She works as a clinical research coordinator at USC School of Medicine on Huntington’s disease studies and memory disorder studies. She has years of work experience working with patient in hospital and nursing home settings. 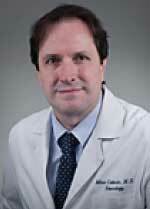 Miroslav Cuturic, MD, serves as an Assistant Professor of Clinical Neurology at the University of South Carolina School of Medicine and Palmetto Health in Columbia, SC, and has been the director of the Huntington’s disease (HD) clinic since 2010. Dr. Cuturic has initiated clinical research and authored publications in peer-reviewed journals pertaining to HD. He is the site’s primary investigator for Enroll-HD and has an interest in developing collaborative translational HD research at the University of South Carolina School of Medicine. The HD clinic at the University of South Carolina School of Medicine received a Huntington’s Disease Society of America Center of Excellence Designation in 2018.